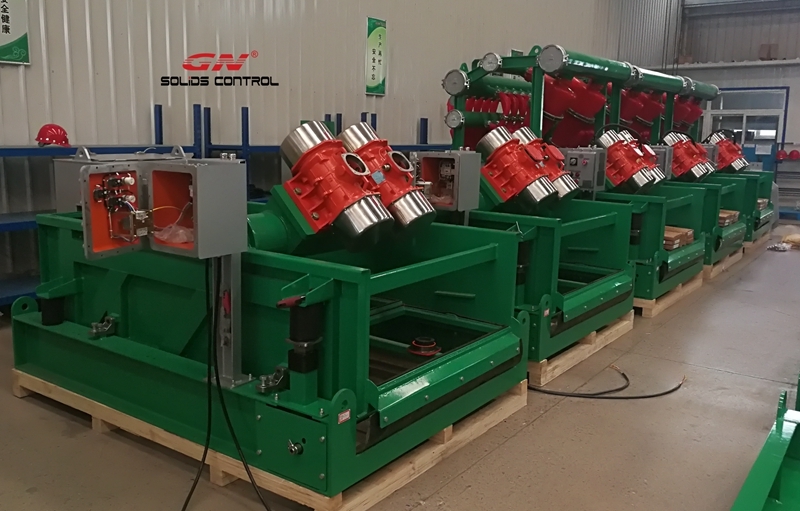 This week GN solids control shipped 10 units linear motion shale shaker to India for oil drilling rig. 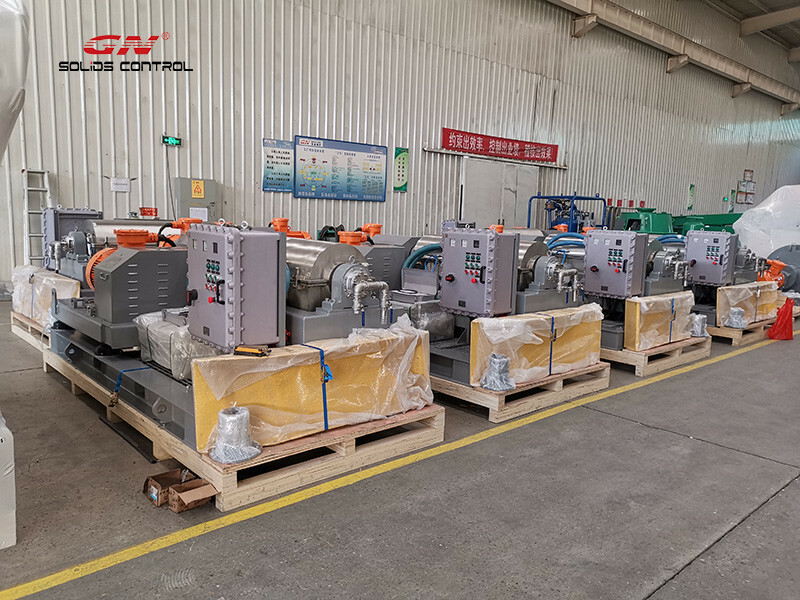 This is the repeat order for the client, they already purchased linear motion shale shaker, mud cleaner, vacuum degasser and complete solids control systems in the past years for oil drilling rig solids control and drilling waste management system. 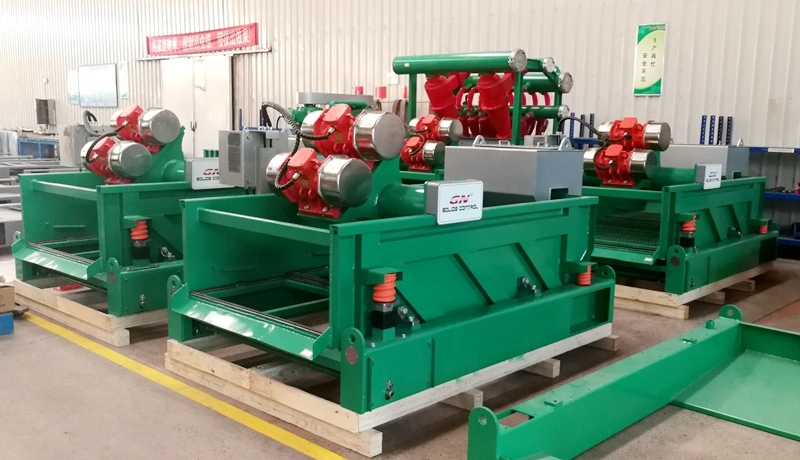 GNZS703F-HB linear motion shale shaker is the best sold model shale shaker with 3 panel screens. 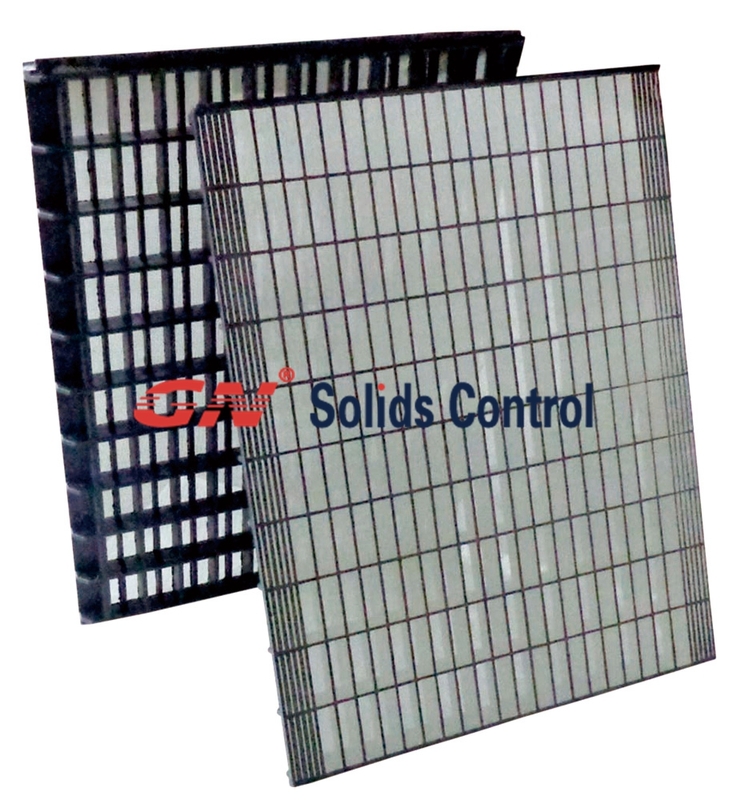 The shaker screen is the composite material shaker screen made by GN solids control. The mud cleaner underflow shale shaker model is same with the shale shaker model. The max G force is up to 7.6 G (adjustable), 2 ea of 2.3 HP Italt Oil brand vibration motor, mechanical adjustment of the deck angle with reliable quality. 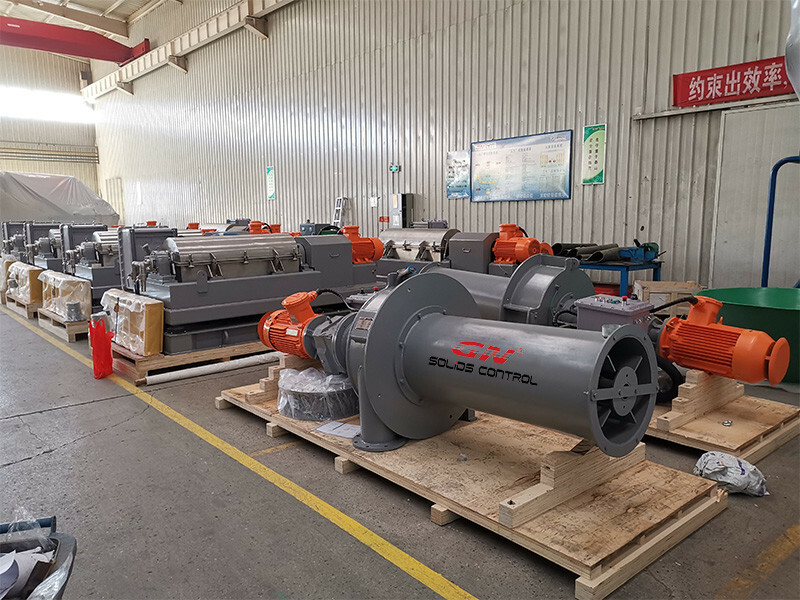 A good performance shale shaker can protect the further process equipments, like centrifugal pump, desander, desilter, it can reduce the drilling waste and save the cost for drilling waste management. The poor quality shaker screens and shale shaker will increase the coarse solids and increase the solids content in the drilling fluids, which can not be used again for drilling. 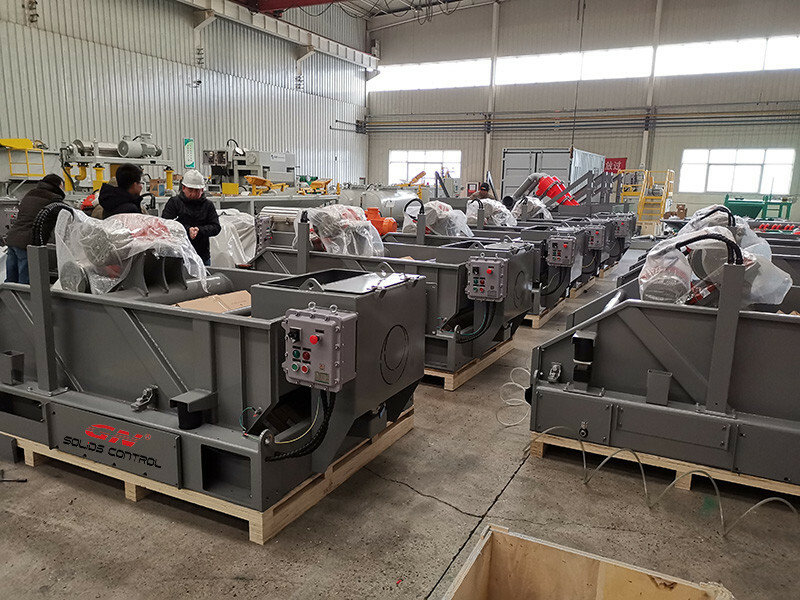 Recently one set of 1500HP Drilling Rig Solids Control System Package is almost finished production for India client, this is the repeat order from the same client for customized design. 1) 3 phase cleaning of drilling fluids, shale shaker is the first phase cleaning and the most important cleaning of the drilling fluids, the better separation performance of the shale shaker, the better cleaning of the whole solids control system, if the shale shaker did not work well, the coarse solids will drop into the sand trap and it can not control the solids content effectively, it will influence the cleaning performance of the next step cleaning desander cone and desilter cone, the higher solids content will damage the desander cone and desilter cone very easily and quickly. Also the centrifugal pump will be also easily damaged for the same reason. Desander cone is the second phase cleaning, desilter cone is the third phase cleaning, the cut point is 20 microns. The decanter centrifuge system is an additional requirement as the 4th phase cleaning. We installed the durable composite material shaker screens for the better separation performance, the effective screen area is 20% larger than steel frame shaker screens, the storage period is up to 5 years, the working life is much more longer than traditional steel frame shaker screens. 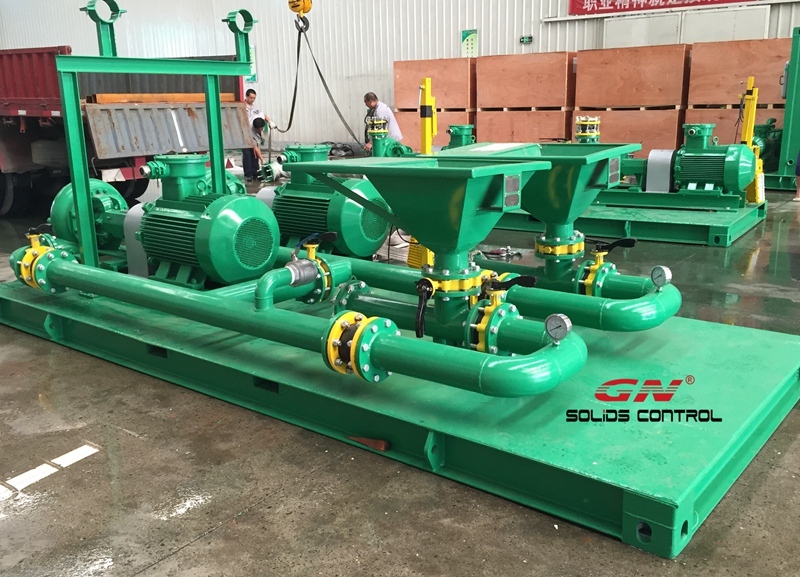 This week GN solids control shipped one set of 1000HP rig solids control system to Romania. 5 sets of container sized mud tanks, with safety guard handrails, walkways, stairs, valves, flexible connection. 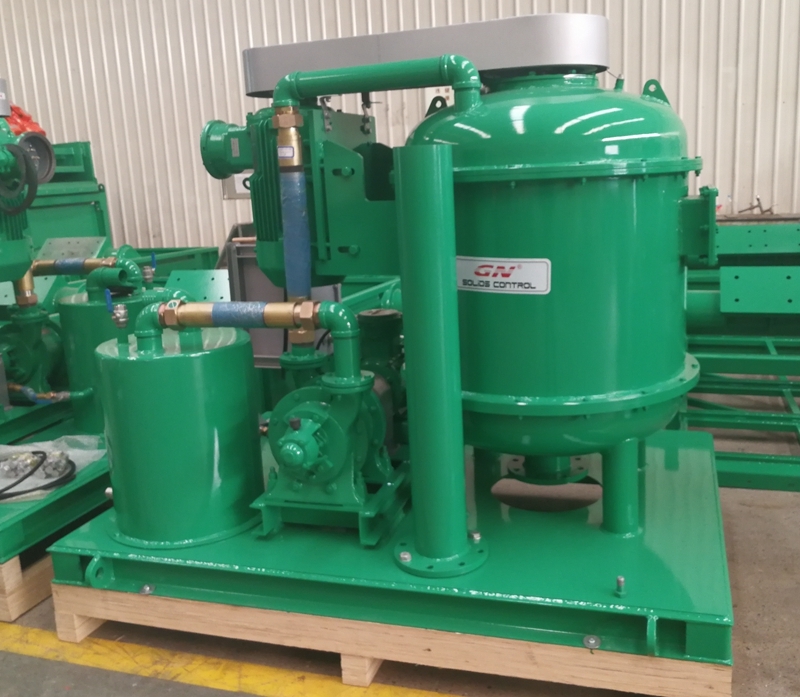 The mixing pump, charging pump, feeding pump all with the same model centrifugal pump, all the spare parts are replaceable with Mission Magnum pump. All the compartment with proper size mud agitator except for sand trap. 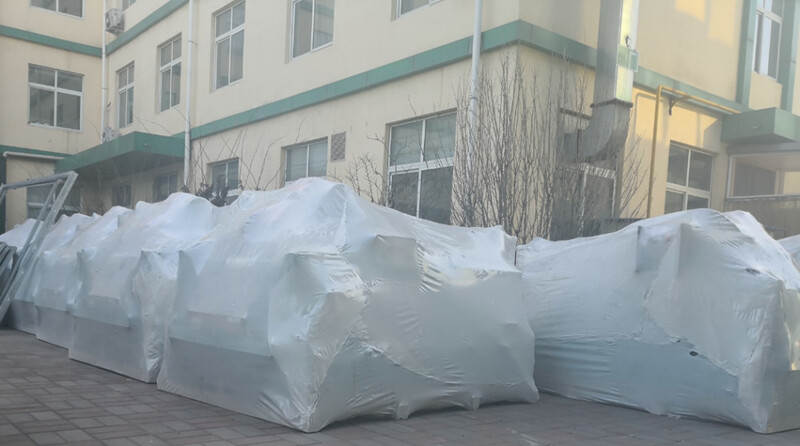 Recently we have several mud tank systems under construction, the workers have to working hard by 2 shift everyday to finish the production, through the proper management and arrangement, we finished the order on time. 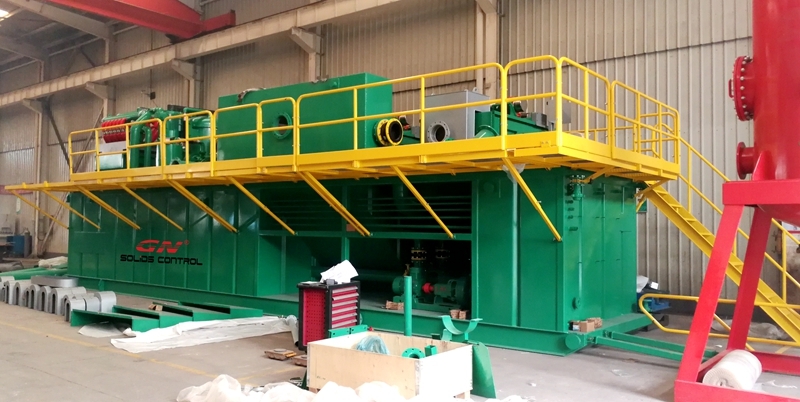 The shale shaker and mud cleaner bottom shaker has the same model shaker, we produce our own shaker screens for our shale shaker. Our composite material shaker screen dimension is replaceable with Swaco Mongoose PT shaker screen. The composite material screen has longer working life and larger effective screen area, better separation performance, the composite material frame is thinner than metal frame, so the effective screen area became larger. 1) Replacement shaker screens and spare parts for GN made solids control equipments, including 585x1165mm screens for GNZS594E shale shaker, 700x1250mm screens for GNZS703 series shale shaker, 750x900mm screens for GNZS752 series shale shaker. Locking wedges, sealing rubber, damping springs, desander cone, desilter cone, bearings, oil seal, gearbox, decanter centrifuge tungsten carbide tiles,etc. 4) Desander cone and desilter cone for Derrick mud cleaner and desander. 5) Mud tank spare parts, including butterfly valve, ball valve, flexible hose, air union, hammer union, mud gun, mud agitator, mixing hopper, centrifugal pumps, etc. Solids control system is very important in a drilling site for it not only ensures safe drilling but also saves a lot cost by recycling the drilling mud. 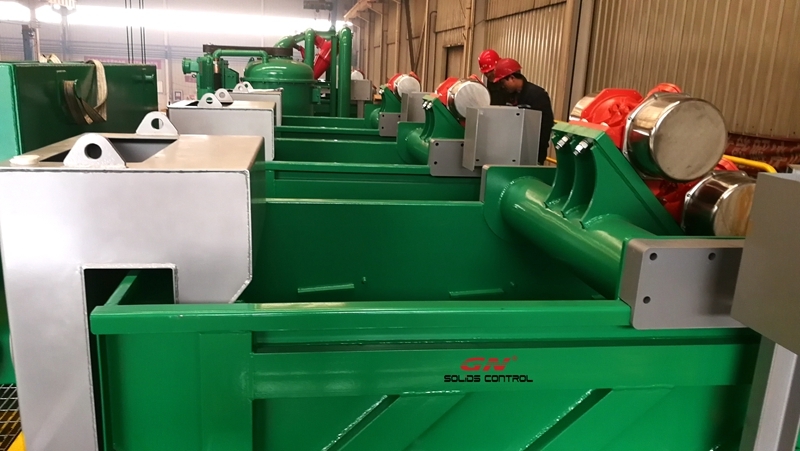 GN solids control is the 1 st API certified manufacturer of solids control system and equipment in China, and also certified by CE which is always required by European customers. 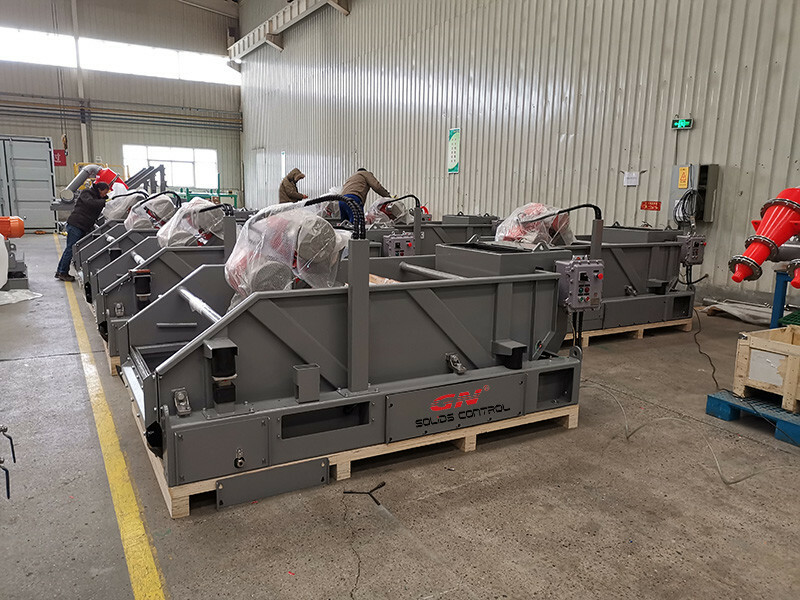 Last week, GN solids control finished 3 sets of solids control system for an European customer, and now those system are ready for delivery. This is a repeated order from this customer, last time they ordered one set of solids control system for 750 hp drilling rig. The main equipment included in these three solids control system is listed as below. 3 sets of shaker tanks, each mounted 2 shale shakers, 1 mud cleaner, and 1 vacuum degasser. 1 set of decanter centrifuge tank with 1 medium speed decanter centrifuge and 1 high speed decanter centrifuge. 1 set of active mud tank with agitators and mud guns. 1 set of suction tank with mud agitators and mud guns. 1 set of mixing tank with mixing hoppers and mixing pumps. These are standard solids control system: shale shaker for 1 st stage treatment; mud cleaner for second stage treatment; medium speed and high speed decanter centrifuges for third stage treatment also known as the final stage treatment. 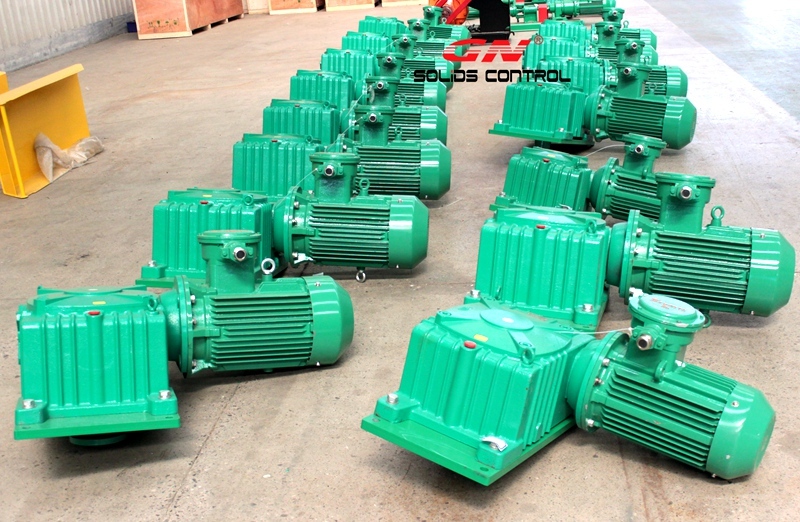 As mentioned before, the 3 sets of solids control system are exported to Europe, ATEX is required for motors and electric control panels, CE is required for all equipment. 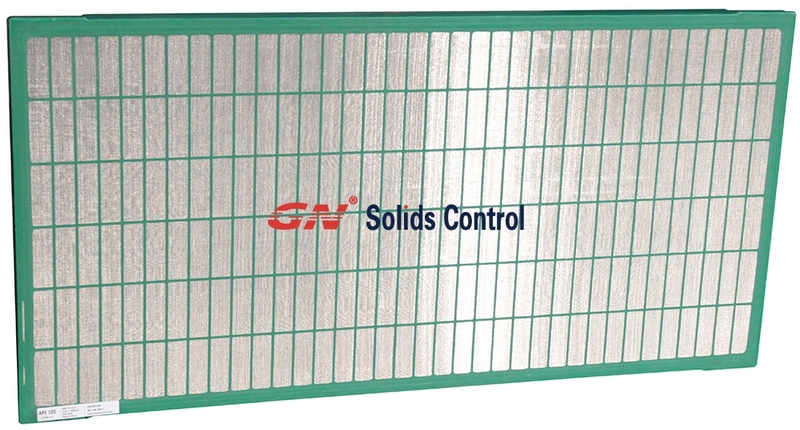 GN solids control is one of the few companies holding all these certificates. 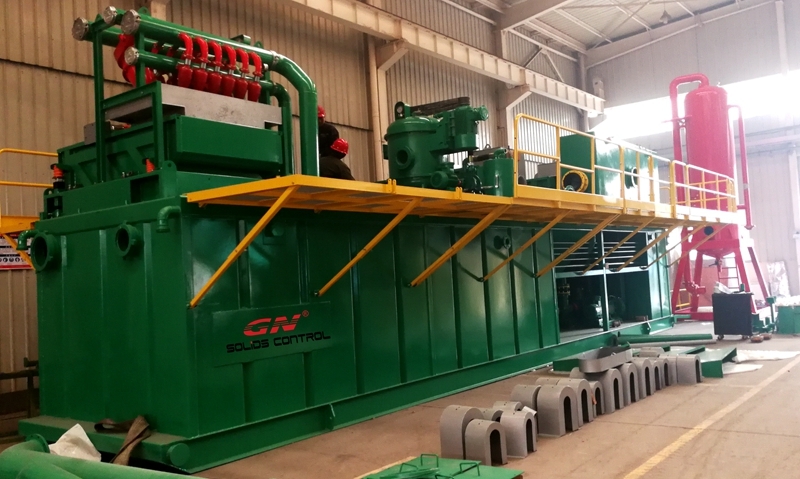 Besides solids control system, GN solids control also manufactures and supplies mud system for other kinds of drilling such as HDD and uprising geothermal drilling.